We have three holiday shows to meet the needs of your group, whether it’s for a school, church, party or festival. All three are secular Christmas-themed shows. FOXY CHRISTMAS A tale of Christmas spirit and friendship. This endearing Christmas story is about a hungry fox and a lonely bunny, and how they find that, for them, the true meaning of Christmas is friendship. Although there’s no mention of any reindeer in the forest, Santa Claus still manages to make an appearance—much to the delight of the audience! PICCADILLY HOLIDAY A secular, holiday-themed variety show. The show will feature several pieces including a rod and hand puppet version of “The Nutcracker”, an ice-skating marionette, and an original hand puppet story of an elf that comes to Atlanta to escape the North Pole snow. The benefit of this show is that it will be adaptable to whatever length the presenter needs. All ages. ‘TWAS THE NIGHT BEFORE CHRISTMAS Piccadilly takes a few liberties with the classic holiday poem penned by Clement C. Moore more than 100 years ago. 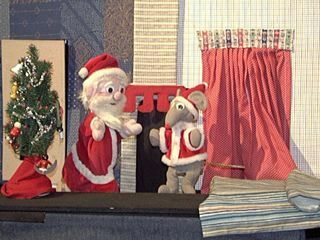 In this version, performed with hand puppets, children will get the real story of that night from a mouse who was an eyewitness to the whole affair. It’s a merry tale with lots of silly twists and turns to entertain and amuse children of all ages. PreK-5, families, or senior citizens.